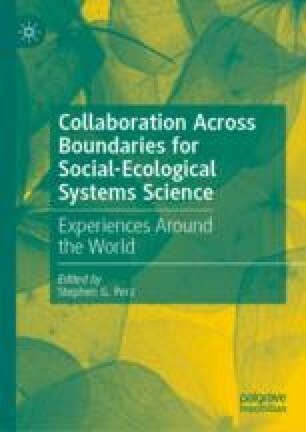 We report in this chapter our experience in collaboration across boundaries from working on an interdisciplinary project funded by the National Science Foundation under the Dynamics of Coupled Natural-Human Systems program. The project investigates the sustainability of the Mississippi River Delta (MRD), which is considered one of the most vulnerable coastal zones in the continental United States and the world. Our overarching research question is: will the MRD reach a tipping point that would make it difficult to sustain in the future? The project consists of seven components, each led by investigators from disciplines including hydrology, sedimentology, ecology, geography, political science, economics, and finance. We conducted a survey of the team members to obtain their opinions on the challenges, benefits, and suggestions for improvement regarding collaboration across disciplinary boundaries. The results provide insights into the development of best practice for collaboration across boundaries. Survey results suggest that a successful interdisciplinary project would need a detailed research plan with timelines and expected results stated, and the plan would need to be followed through. Finding collaborators who have similar priorities, can deliver the results on time, and continue engagement in the research is difficult, but the reward in making it happen is gratifying because it will ultimately be beneficial to advancing the science and practice of sustaining complex natural-human systems. This material is based upon work supported by the US National Science Foundation (award number: 1212112). Any opinions, findings, and conclusions or recommendations expressed in this material are those of the authors and do not necessarily reflect the views of the funding agencies. Bianchette, T., Liu, K. B., Qiang, Y., & Lam, N. S. N. (2016). Wetland Accretion Rates Along Coastal Louisiana: Spatial and Temporal Variability in Light of Hurricane Isaac’s Impacts. Water, 8(1), 16 p. https://doi.org/10.3390/w801000. Cai, H., Lam, N. S. N., Zou, L., Qiang, Y., & Li, K. (2016). Assessing Community Resilience to Coastal Hazards in the Lower Mississippi River Basin. Water, 8(2), 46, 18 p. https://doi.org/10.3390/w8020046. Coastal Protection and Restoration Authority of Louisiana (CPRA). (2017). Draft Coastal Master Plan. http://coastal.la.gov/a-common-vision/2017-draft-coastal-master-plan. Accessed 12 Jan 2017. Couvillion, B. R., Barras, J. A., & Steyer, G. D. (2011). Land Area Change in Coastal Louisiana from 1932–2010. U.S. Geological Survey Scientific Investigations Map 3164, Scale 1:265,000, 12 p. pamphlet. http://pubs.usgs.gov/sim/3164/. Accessed 30 Nov 2014. Cutter, S. L., Burton, C. G., & Emrich, C. T. (2010). Disaster Resilience Indicators for Benchmarking Baseline Conditions. Journal of Homeland Security and Emergency Management, 7(1), article 51. https://doi.org/10.2202/1547-7355.1732. Dismukes, D. E., & Narra, S. (2016). Identifying the Vulnerabilities of Working Coasts Supporting Critical Energy Infrastructure. Water, 8, 8. https://doi.org/10.3390/w8010008. Joshi, S., & Xu, Y. J. (2017). Bedload and Suspended Load Transport in the 140 km Reach Downstream of the Mississippi River Avulsion to the Atchafalaya River. Water. https://doi.org/10.3390/w9090716. Lam, N. S. N., Liu, K. B., Reams, M., Rivera-Monroy, V., Xu, J., Pace, K., Dismukes, D. (2012). CNH: Coupled Natural-Human Dynamics in a Vulnerable Coastal System. Award Abstract #1212112. National Science Foundation. http://www.nsf.gov/awardsearch/showAward?AWD_ID=1212112. Lam, N. S. N., Reams, M. A., Li, K., Li, C., & Mata, L. (2016). Measuring Community Resilience to Coastal Hazards Along the Northern Gulf of Mexico. Natural Hazards Review. https://doi.org/10.1061/(asce)nh.1527-6996.0000193. Lam, N. S. N., Xu, Y. J., Liu, K. B., Dismukes, D. E., Reams, M., Pace, R. K., et al. (2018). Understanding the Mississippi River Delta as a Coupled Natural-Human System: Research Methods, Challenges, and Prospects. Water, 10, 1054. https://doi.org/10.3390/w10081054. Li, K., & Lam, N. S. N. (2018b). Geographically Weighted Elastic Net: A Variable-Selection and Modeling Method Under the Spatially Nonstationary Condition. Annals of the American Association of Geographers. https://doi.org/10.1080/24694452.2018.1425129. Louisiana Department of Natural Resources. (2014). Louisiana Energy Facts Annual—2013. Baton Rouge, LA, USA. Available Online: 33. http://www.dnr.louisiana.gov/assets/TAD/newsletters/energy_facts_annual/LEF_2015.pdf. Accessed 10 May 2018. Qiang, Y., & Lam, N. S. N. (2016). The Impact of Hurricane Katrina on Urban Growth in Louisiana: An Analysis Using Data Mining and Simulation Approaches. International Journal of Geographical Information Science. http://dx.doi.org/10.1080/13658816.2016.1144886. Twilley, R. R., Bentley, S. J., Chen, Q., Edmonds, D. A., Hagen, S. C., Lam, N. S. N., et al. (2016). Co-evolution of Wetland Landscapes, Flooding and Human Settlement in the Mississippi River Delta Plain. Sustainability Science. https://doi.org/10.1007/s11625-016-0374-4. Wang, B., & Xu, Y. J. (2018). Decadal-Scale Riverbed Deformation and Sand Budget of the Last 500 Kilometers of the Mississippi River: Insights into Natural and River Engineering Effects on Large Alluvial Rivers. Journal of Geophysical Research: Earth Surface. https://doi.org/10.1029/2017jf004542. Zou, L., Kent, J., Lam, N. S. N., Cai, H., Qiang, Y., & Li, K. (2016). Evaluating Land Subsidence Rates and Their Implications for Land Loss in the Lower Mississippi River Basin. Water, 8(1), 15. https://doi.org/10.3390/w8010010.